She is planning on doing the Habitat for Humanity International Volunteer Program and was trying to decide which destination to choose for her work commitment. 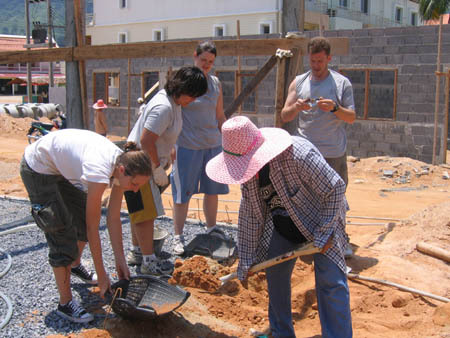 I love this long-term volunteer program, and also love Habitat’s Global Village Program where volunteer workers go to foreign countries to build homes or do disaster relief work for two-week stints. There is a Habitat program for you no matter your appetite for intrepid adventure or sticking close to home (US programs flourish and provide amazing volunteer opportunities) and however much time you have to give. I am Priti Thapa, from Kathmandu, Nepal. The first thing that attracted me to your blog was the title itself. Being a Nepali, I love to read every and any blog re: Nepal. All my respect to you and your friend for doing so much for the Human cause. I hope one day I see her in Nepal too. As you may know Nepal is in a high-danger of earthquake and there has been high alert too, Kathmandu (Capital City) is pointed as the focal point to be hit. We will need you help if god forbid something like that will be a reality. Thank You for considering my country, please convey my regards to her. My best wished to Habitat for Humanity International Volunteer Program Team.